MEMBERS at all levels receive these great benefits! NEW DIGITAL MEMBERSHIP DIRECTORY, listing all members alphabetically and geographically, offering additional advertising opportunities, with live links, and downloadable for printing. ONLINE PROFILE LISTING with your contact information, logo and social links to enhance your search rankings. MEMBER NEWS AND EVENTS published on our website and distributed in our E-Newsletter, "The Chariot"
TARGETED ADVERTISING OPPORTUNITIES with web and print packages tailored to your marketing needs, with the Society's logo provided for use in your marketing materials. 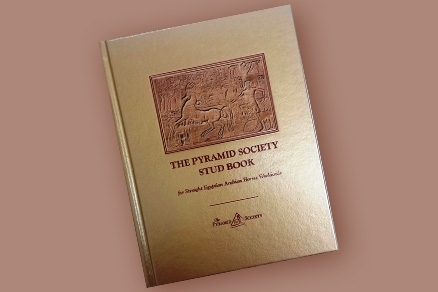 PERSONALIZED EGYPTIAN ARABIAN BROCHURE This complimentary full-color brochure is available as a customized marketing tool, including your logo and contact information. EDUCATIONAL REFERENCE MATERIALS available at a discount to members. STRAIGHT EGYPTIAN CERTIFICATES verifying hour horses' lineage offered at a discounted rate to members. EDUCATIONAL OPPORTUNITIES with special member rates at regional events and Egyptian Breeders’ Conferences. DEDICATED MEMBERSHIP COMMITTEE with representatives located across the U.S. and Canada, serving to promote networking, local and regional events, and provide member support. PERFORMANCE HORSE AWARD & RIDERS UP PROGRAMS providing worldwide recognition for your Egyptian Arabian athletes with complimentary enrollment. ALL AMERICAN STRAIGHT EGYPTIAN CHALLENGE CUP participation in qualifying shows nationwide. Discounted Dues, Special Payment Options, and Gift Certificates. MEMBER OUTREACH PROGRAM providing international visibility and complimentary promotional materials for distribution at your eligible local event, open house or regional activity. A PROFESSIONAL STAFF dedicated to assisting our members in taking advantage of every available benefit. †Premium Membership is required for owners of at least a 20% interest in a Straight Egyptian or Egyptian-Sired Arabian horse (as defined by The Pyramid Society) who are participating in The Egyptian Event show ring, in any Breeder Incentive Programs (such as the Futurities or the EBC), or in future designated programs.